"I watched your DVD - Before and After Learning Dog Language and ordered the other two DVD's as well. Wow, it is so informative I showed my entire family." "My husband, daughter and I have watched the video three times already and each time I pick up something different and new." Canada. "My friend lent me your DVD's and I cannot believe the change in my dogs - I learnt sooo much!!" and is so kind, that your dog will love you (even more) for it! and is so easy that you will wonder why you never thought of it before! Natures Way is the easy way. Let it be your first resort! People who don't (need to) tell their dogs to sit, or (have the skills not to) bribe their dogs with treats, and who (are humane enough) to satisfy their dog's hunger, are regarded as belonging to the Flat Earth Society. Nature Does Not Have Fashions. The Laws of hte Jungle have been working very well since before the Stone Age. And still are. In the DVD you see about 30 minutes of what goes on behind the scenes within the dogs' own homes; how many dog owners are experiencing problems with their dogs; and how, in spite of doing exactly what they have been told to do, their dogs' behaviour still deteriorates. This DVD places the power in your hands - instead of in the hands of the dog system. Or of the dog, so don't let him see it. Plus postage and packaging - R55 ordinary mail, R85 Speedpost and R150 delivered to your door by courier. All orders are sent off within 24 hours of receiving your order - usually less. "In this informative and entertaining footage, dog psychologist Pam Whyte explains how to get a deeper insight into your dog's mind and instincts so that your pet becomes your friend and companion..and tells you what they have to say about us!" 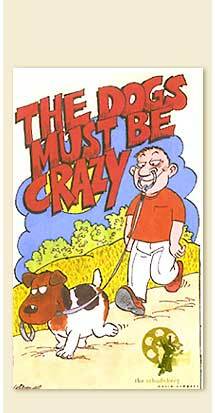 "The Dogs Must be Crazy is well-known 'pet shrink' Pam Whyte's third home movie, aimed at fostering a mutually rewarding relationship between dog and owner. It features footage of actual house calls of owners of dogs with a variety of behavioural problems, and Pam Whyte shows how, by better understanding canine communication, owners can turn doggie delinquents into obedient companions, without raising either your voice or your hand." One dog owner said: "I saw this movie at a friend's house. When I now go to my friends, and they see how I can handle their dogs, the call me "The dog psychologist!" And a dog trainer said: "If I had not see how Pam did it, I would have thought it was rigged! What most people seem to like about The Dogs Must be Crazy, is that it makes them realise that they're not the only ones who are experiencing behaviour problems with their dogs - in fact, they're standard! And even better - they see dogs that are even worse behaved than theirs! And better still, they see how even the worst behaved dogs reform once they are understood. This home movie shows unrehearsed footage of actual Natural Dog Training sessions within the dog owners homes, which answers so many questions that typical dog owners ask. It shows how well Nature's Formula for Obedience works, demonstrating these natural, non-gimmicky techniques step by simple step. This is a true Canine Soapie, where you see how people actually live with, and interact with their dogs - and with one another over their dogs. It is real life, not rehearsed straight lines where dogs that break their stay are edited out, and no-one discusses their feelings. Here, you see the gamut of emotions that go with so much of dog owning. Humour, tears, quarrelling, making up, guilt, joy - they are all caught by the lens. All spontaneous and sincere. All of which we dog owners can relate to so easily. And this is another of the reasons why Pam gets the results that she does - feelings are acknowledged, and are recognised as an important part of dog owning. The way we feel about our dogs, the way they feel about us, is crucial. Dog owning is an emotional attachment, and when our dogs fail to live within acceptable parameters - our emotions go awry. We are emotional about our dogs - and they are emotional about us. Leaving our emotions out of training is like leaving baking powder out of a cake. (Or cement out of a building.) Or barking up the wrong tree. At the beginning of the movie, you meet Michelle in tears over her impossible Pit Bull. Then two weeks later we visit her again, and you see her saying proudly and delightedly: "My dog respects me!" All goods are posted off within 24 hours of receiving notification of payment - usually less. Please email proof of payment and your name and address to Paul Anderson at: Paul@TrustworthyDogs.com.